You have to wonder when all the dinosaurs will be found. When will nothing remain to be discovered? That day is apparently a long way off. New dinosaurs keep popping out of the ground. In my home province, Alberta, it’s another day and another major discovery. Last month, it was Regaliceratops peterhewsi — a new genus and species of ceratopsid, or horned dinosaur. It lived about 68 million years ago and has been nicknamed Hellboy because it resembles Hellboy, a comic book character with yellow eyes and (usually) a cigarette dangling from its muppet-like mouth. I suppose that’s what Regaliceratops also looked like when she was alive and smokin’ back in the Cretaceous. Today another new triceratops was announced. The triceratops family is growing – there are twice as many species known today as just ten years ago. The latest find is the Wendiceratops pinhornensis. Named either for the little girl from Peter Pan’s world, or else for Wendy Sloboda, the intrepid legendary Alberta humanis who regularly discovers fossils of exciting new species. Congratulations to her for having a huge three-horned animal with a six-metre body and a large, frilled bony-shielded face as a name twin. 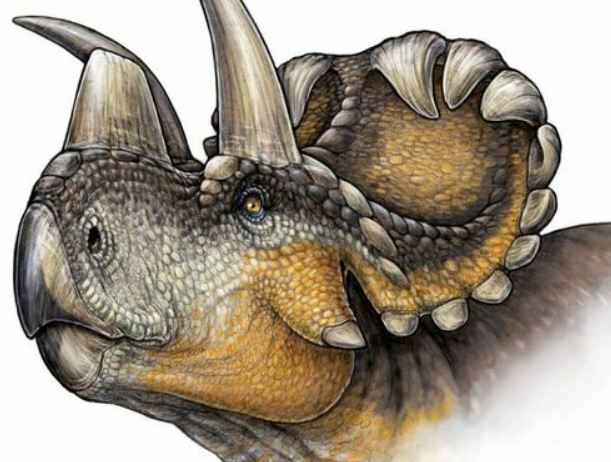 The 79-million-year-old bones represent a nosey, socially active creature that travelled in herds and probably used its frills, horns, large nose, and spectacular (though as of today, unknown) colouration simply to attract attention. Very nice and very sociable, but it is the real Wendy that I’d rather have tea with. Wendy Sloboda. Photo from Journal, the University of Lethbridge Alumni Magazine. Wendy Sloboda is a paleontological technician with a Bachelor of Arts (2001) from the University of Lethbridge (Alberta). She discovered bones in Mongolia’s Gobi Desert that may be another new dinosaur species. And last year in Argentina, Sloboda discovered the footprint of yet another new dinosaur. They named it for her – it’s the Barrosopus slobodai, a ground-dwelling birdish carnivore. Imagine if the two creatures named for Wendy Sloboda (Wendiceratops pinhornensis and Barrosopus slobodai) were assembled in a museum as one giant man-eating, big-nosed bird-footed three-horn. The Wendiceratops slobodai. Ah, that would set paleontology back a few decades, wouldn’t it? This entry was posted in People and tagged fossils, Hellboy, triceratops, University of Alberta, Wendy Sloboda. Bookmark the permalink.